Select the best available applicants with consistency and confidence. Just as a credit score predicts the likelihood that a loan will be paid, our tenant score assesses risk by predicting the likelihood a tenant will fulfill a lease obligation. Using inquiry, credit, and eviction data, MyRental generates a three-digit score between 200 and 800. The score summarizes the potential risk of the applicant compared to others. 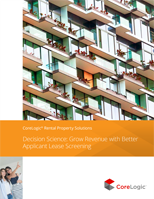 The higher the score, the less likely the applicant is to default on a lease. History on rental non-payments, property damage and evictions. Few missed payments and no outstanding collections records. Excellent payment history, solid work history, no outstanding collections records.